When the covers were first taken off the Pelagos LHD last year, it was a surprise. 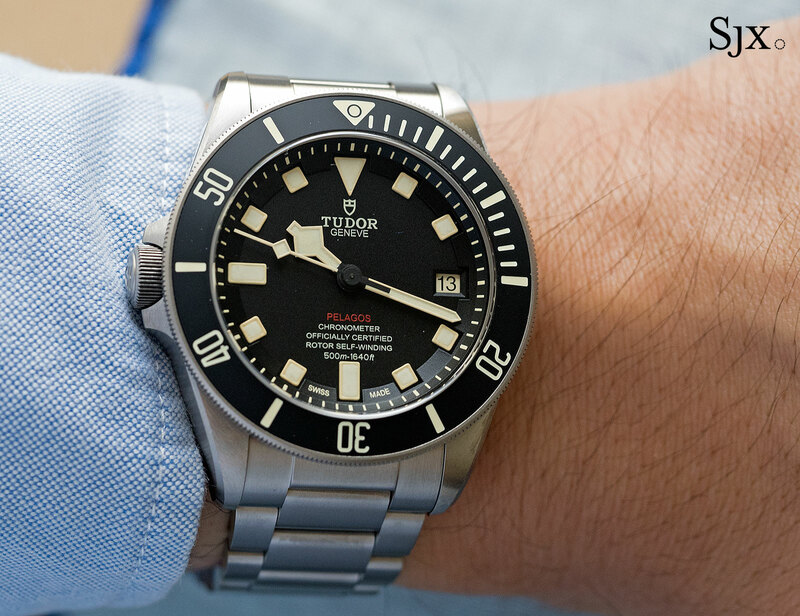 From the left-handed crown to the numbered case back, the Pelagos LHD was different from what Tudor had done before. 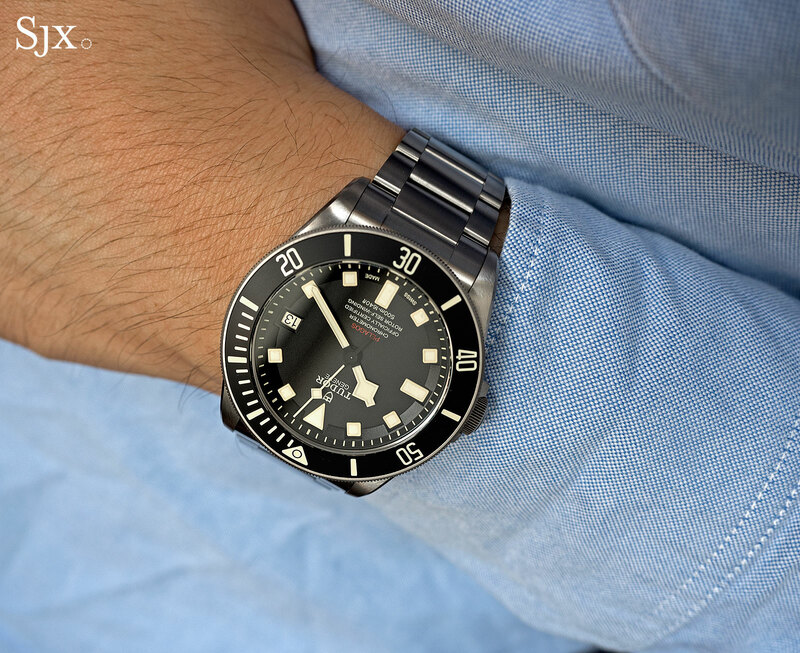 In fact, the Pelagos LHD can be described as a hipster timepiece, being carefully curated to cater to current tastes for a specific type of vintage watch. It combines various elements that collectively evoke memories of vintage sports watches. 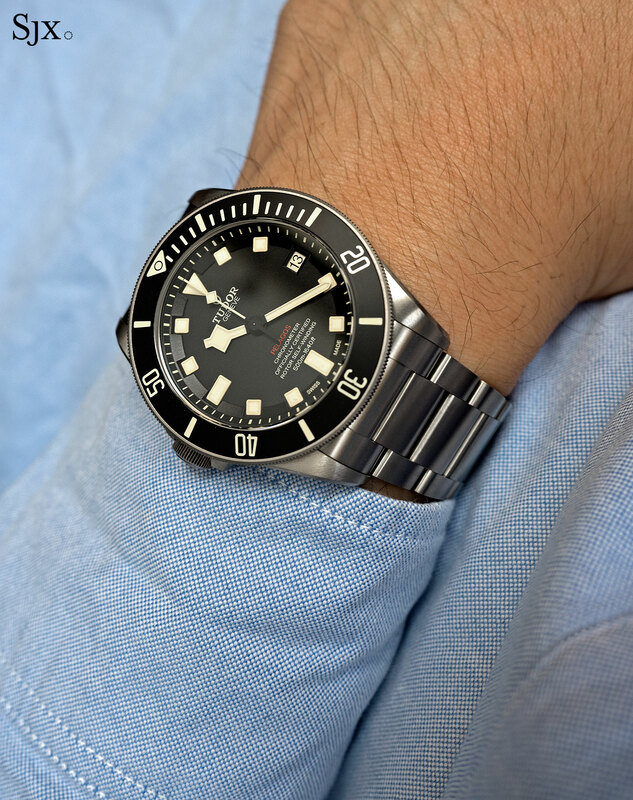 Left-handed dive watches are not uncommon, having been historically custom-made for military personnel, either to be worn on the right wrist, or to prevent the crown digging into the back of the palm (as with the Sinn EZM 1 for Germany’s customs police) when worn more conventionally on the left wrist. Arguably the best known lefty watches are the Panerai Luminor destro watches of the 1940s, named after the Italian word for “right-handed”, which have been been reissued quite profitably. 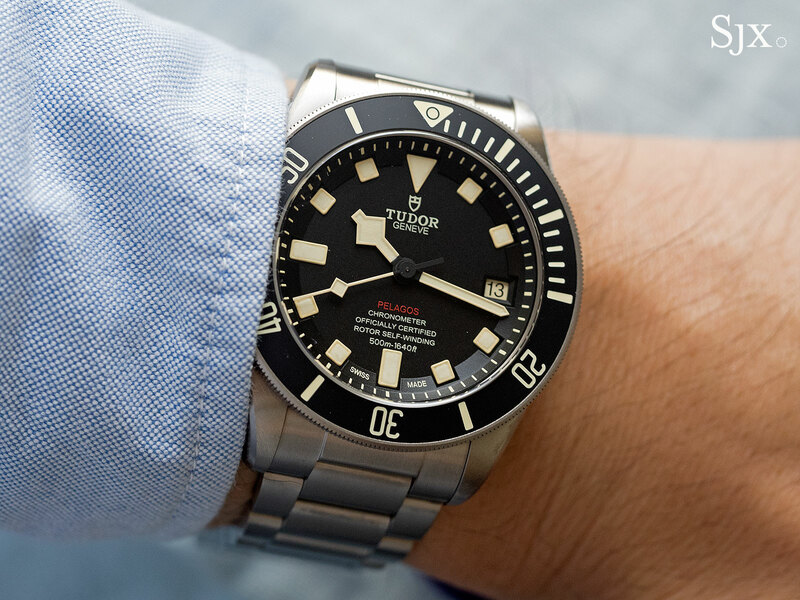 Similarly, Tudor produced a single left-handed Submariner for an officer in the French Marine Nationale in 1981, a watch now in Tudor’s archives that serves as the inspiration for the Pelagos LHD. From a more practical perspective for a right-handed person, the crown at nine o’clock initially throws you off. At least for the first couple of days of wear it feels off kilter. Oddly enough that sensation isn’t evident with a destro Panerai, maybe because the Luminor crown lock is unusual to start with. When the crown is hidden under a sleeve, the sensation is magnified – something seems missing. But the incongruence disappears swiftly. After less than a week it feels right, helped by the fact that the rest of the watch looks and feels good. The titanium case is a boon. Once exotic titanium is now commonplace and low-cost, but what the alloy lacks in novelty it makes up for in utility. Titanium is lightweight, a quality for which it’s not appreciated enough, especially for a large watch like the 42mm Pelagos LHD. Other comparably sized Tudor dive watches in steel or bronze both look and feel big, while the Pelagos feels functional and unburdened. Visually titanium is at home with the design philosophy of the watch. The dull grey of the case, which is brushed on all surfaces, is totally at home with the vaguely retro look. And up close the case stands up with scrutiny, revealing impressively sharp edges and neat lines. The bevels on the lugs are notably well done, as are the points of the crown guard. The black ceramic bezel matches the muted finish of the titanium well, but the insert lacks the solidity of ceramic bezels on other watches (Rolex is the inevitable comparison). That is likely due to several reasons, including the matte finish and the fact that the markings are flush with the surface instead of engraved. But nonetheless the ceramic insert has the qualities that make the material desirable – scratch- and fade-resistance. 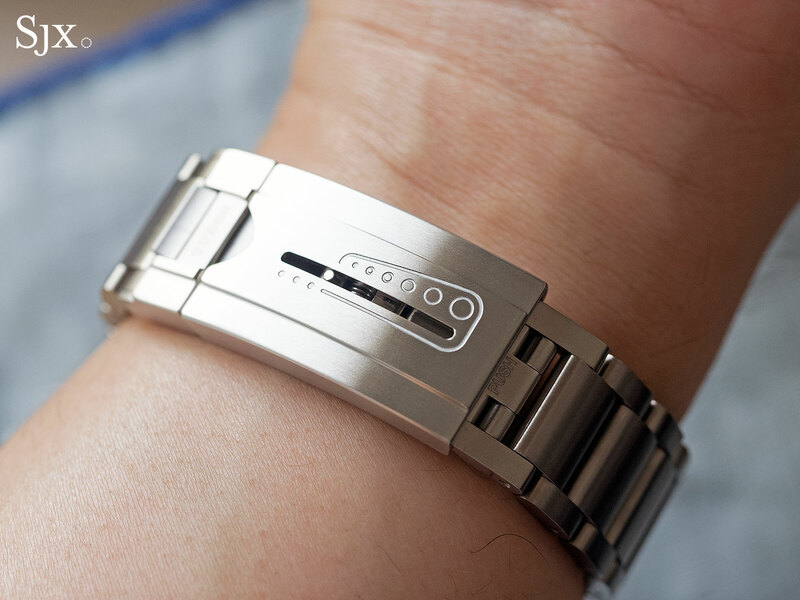 The solidly built titanium bracelet adds to the tactile quality, giving it good balance on the wrist. While the watch is delivered with a rubber strap, the titanium bracelet is unquestionably the winner. The dive extension integrated into the clasp is patented and consists of a link extender, along with a spring-loaded slider that automatically adjusts during a dive. 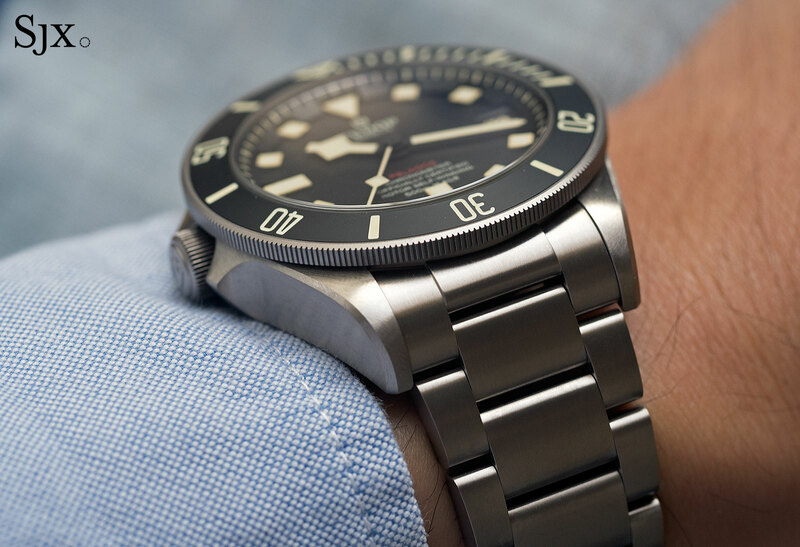 Notably, the spring-loaded slider accomplishes almost exactly the same thing as the finer, and pricier, Glidelock clasp found on Rolex dive watches. While the Tudor extension lacks the finesse of the Rolex, though it is arguably the best at this price point. 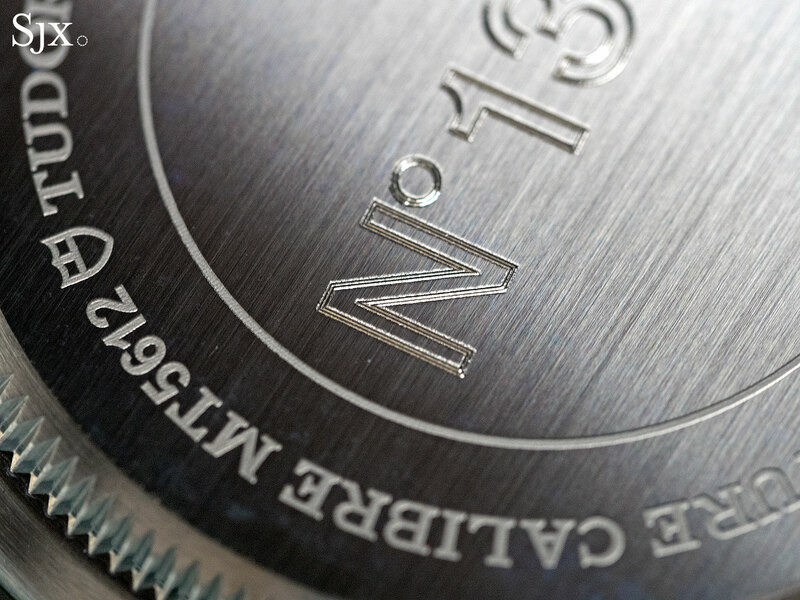 Unlike the rest of the watch that’s titanium, the back is steel and engraved with an individual number. Large and pronounced, the number is distinct from the tiny case serial number engraved on one of the lugs (which comes from a series shared by all Tudor cases across model lines). And it is not a limited edition, so the number is not an indication of the total number made. So the number doesn’t do very much – zero practical value. It does, however, deliver extra satisfaction in ownership, since no other Tudor has a number engraved. It is a contrivance, but a pleasing one. 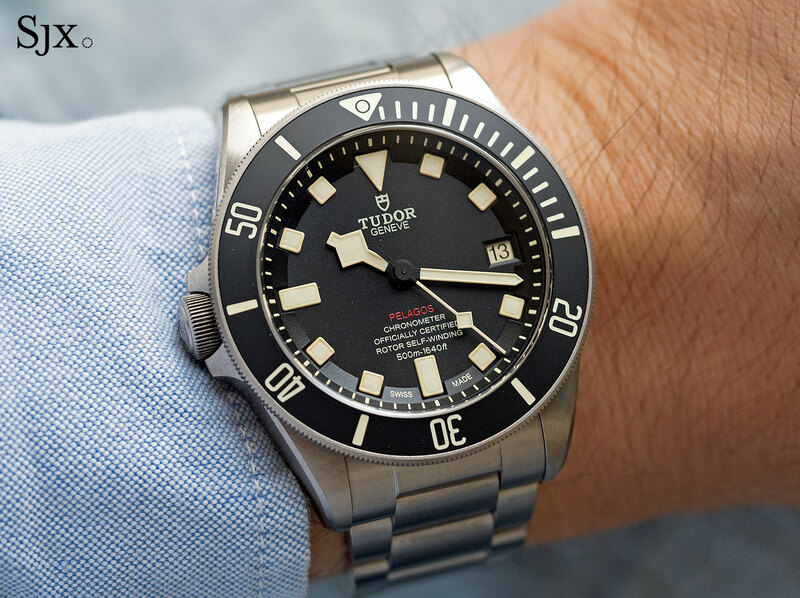 “Pelagos” in bright red on the dial is another agreeable feature that has no practical purpose, but does summon memories of all those “red letter” Tudor and Rolex sports watches from the glory days of the late 20th century. One detail I wish Tudor had dispensed with is the ivory Super-Luminova on the dial and hands – even the bezel markings and date disc are off-white. The faux vintage look is on-trend now, but it verges on trying too hard. The Pelagos LHD does not need that to be a success, especially since the watch is not a replica, as the Omega 1957 Trilogy is for instance. Design quibbles aside, the legibility is faultless, even in the dark. Even though the bezel and Super-Luminova are ivory, they still glow a bright blue in the dark, with no discernible difference with the conventional Pelagos that has white Super-Luminova. 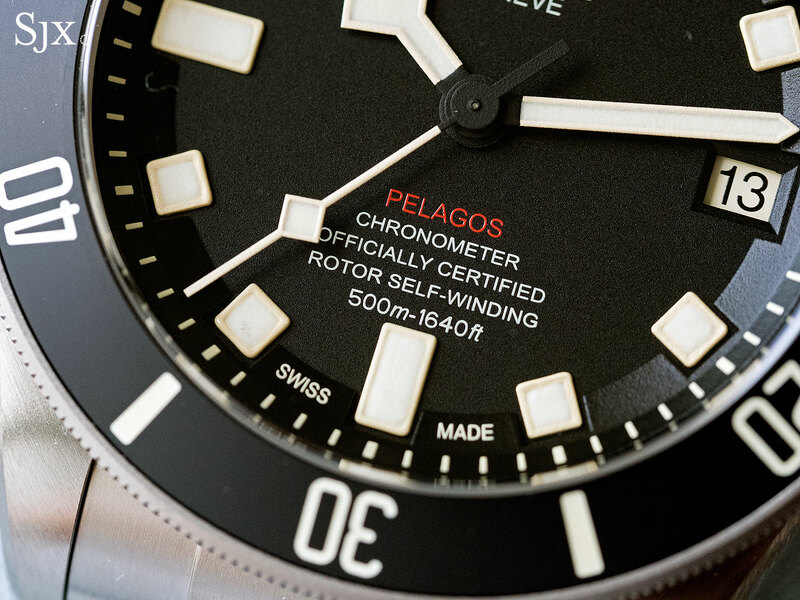 Similarly the Pelagos LHD is complaint-free mechanically. While the cal. MT5612-LHD inside is nothing to look at, it’s hidden behind the solid back and does everything it should. The three-day power reserve is especially useful since the watch keeps running even if off the wrist for a few days. The Pelagos LHD costs US$4400 or S$6048 at retail, making it a strong value proposition. That’s not just down to the specs of the Pelagos LHD versus the competition, but also measured on conventional industry margins. 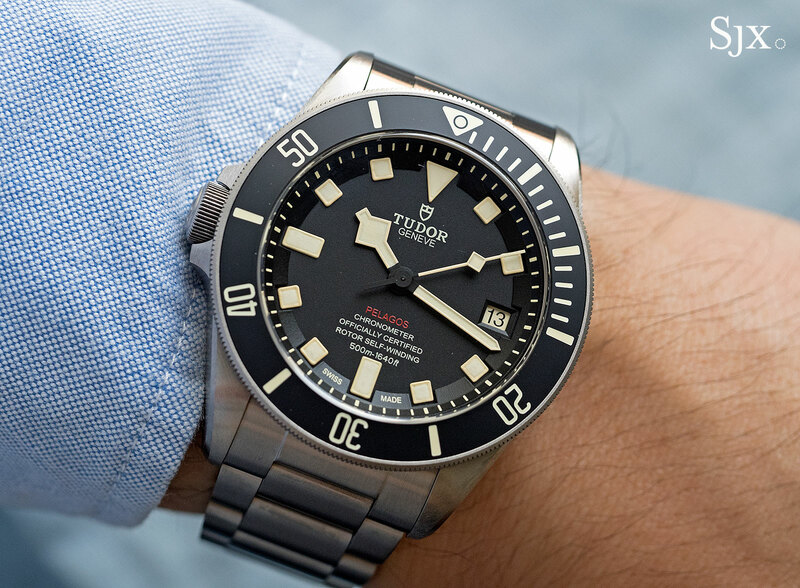 Based on those numbers, Tudor probably makes slightly smaller margins than the competition, while managing above average manufacturing efficiency (perhaps thanks to its big bother Rolex).